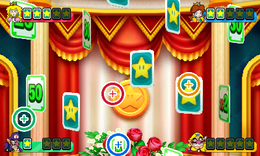 Aim of the Game is a battle and a duel minigame that is found in Mario Party 8. It is also featured in the minigame compilation title, Mario Party: The Top 100. A top hat is on the screen and cards start flying out of the top. Shortly thereafter, the game begins. 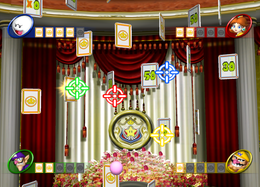 Each player must shoot five cards from a falling deck and try to get the highest score. The cards flip repetitively, and the number on the card (and therefore the point value) is only visible for a short while. The numbers are 5, 10, 20, 30, 50, x2 (which doubles the player's current score), and x0 (which reduces the player's total score to zero). The "x" cards are multipliers. A timer is not visible while the game is in progress, but if the last of the cards fall off-screen, the game ends. Once the minigame announcer says "Finish! ", the value in the cards gets added up or multiplied. Whoever has the most points wins the minigame. The most points a player can get is 800, obtained by hitting a 50 first, and then x2s for the other four, or by hitting two 50s first and three x2s after. In Mario Party: The Top 100, the cards descend noticeably faster. Winning players (as well as second-place players in The Top 100) will perform their respective victory poses, while any losing players will sulk beside them. Wii Remote – Use the Pointer to move the cursor. 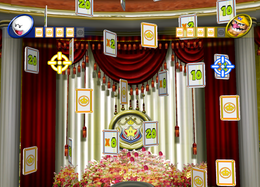 Rules – "Shoot five falling cards to get the highest score. Some cards have face values. Others have multipliers." Hint – "Shoot high face-value cards, then gun for multipliers. But don't shoot the x0 cards. They'll zero out your score!" Description – "Hit 5 cards as they fall, and aim for the highest total score!" On-screen – "Hit 5 cards and aim for a high score!" This page was last edited on August 4, 2018, at 07:54.